SilenceBEseen-words, thoughts and pictures......: Mondays with Coach Kourtney: "Women and Weights"
Mondays with Coach Kourtney: "Women and Weights"
We as women are so scared of weights when we are trying to lose weight. We are also scared to change up our fitness routines. Muscle creates bulk and causes us to gain weight, and the cardiovascular routine has helped us lose weight so far, so why change it up now? Well, first off, muscle burns more calories than fat when you are resting, and you can still get a huge calorie burn and increase in heart rate from lifting weights. Plus, weights are good to use with different interval training moves. Changing up your workouts also keeps you from plateauing because your body, your mind, and your muscles will not get bored. Yes, you may gain weight initially from lifting, but that is only because your muscles retain water to rebuild and move through soreness, therefore any hard workout results in an initial weight gain for the first day or so. Plus, why are you on that scale anyway? Get off! Your clothes and a tape measure are the best indicators for weight loss and fitness, as well as how your body FEELS. I am NOT a fan of the scale. Aerobic and cardio is very good to condition your heart and help your body along, but women NEED weights to strengthen our bones, build the muscle to keep us toned and young looking, as well as from getting flabby while we lose the weight. During your long and intense cardio bouts, you burn SUGAR. 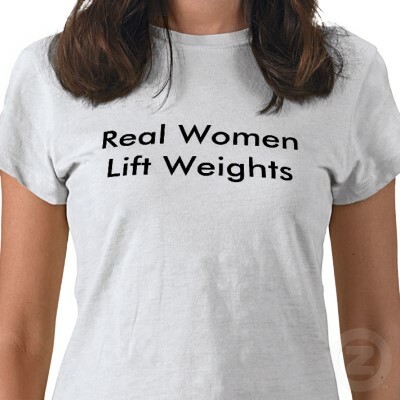 Weights help you burn FAT while building muscle, which burns the calories and the sugar, and helps us look good. Supersets and weights result in firing your metabolism as well as helping your body burn more calories AFTER your workout, which results in fat loss.. So pick up some weights, make sure they are heavy enough that your muscle is tired and fatigued by the last rep and that you are breathing hard. If not, you are just going through the motions. Beyond that, lifting weights are a way to push yourself in a workout. Runners always have to push themselves because they will get faster and their runs will get easier, ESPECIALLY if they are hydrated and eating better at the same time. So they PROGRESS to longer marathons, harder trails, and faster times in order to keep challenging themselves, as Kenya does. It is the same whether you love Zumba, Turbo Kick, or Pilates; you have to change it up to restart your muscles. I’m not saying don’t do it ever again, I’m saying try something new for a couple of weeks, plus you never know what you may or may not like until you try it. Adding weights to cardio moves will get your heart rate flying! Try working upper and lower body together with only 10-30 seconds of rest between your sets. For instance, try squats with shoulder raises, or lunges with curls, 3 sets of 10-15 and only rest for 10 seconds, do another set, rest for 10 seconds, and then do another set. Then move on to the next set. I like to do 2 sets of supersets, jump rope for a minute, another couple sets of supersets, and then burpees, and so on and so forth. So, do me a favor… go online, Google and Youtube “supersets.” Find a couple workouts, rotate them 2-3 times a week for full body toning, and tell me how you feel.